PORTLAND — Lizzy Stevens was a little bit nervous. But, as it turned out, she had absolutely no reason to worry at all. 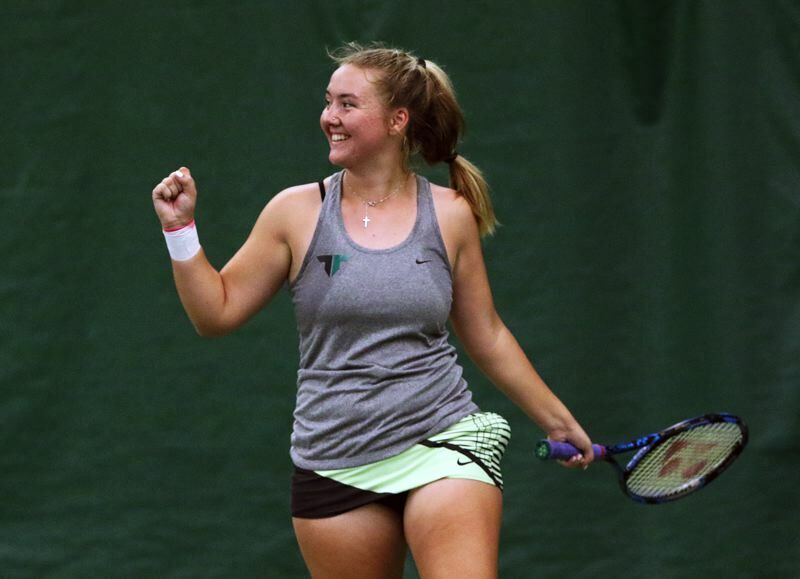 Stevens, a Tigard High School sophomore, stormed to her second straight Three Rivers League district tournament title, powering her way to a 6-1, 6-0 win over Lake Oswego freshman Mariam Nechiporuk 6-1, 6-0 in the girls singles championship match, played May 9 at the Portland Tennis Center. "It was really good," Stevens said after her title victory. "I was a little nervous at first, because I hadn't played her before. I had to get used to her game style, see what she liked and what she didn't like. I got the momentum after 2-1, and kind of cruised after that." Stevens will now look to keep cruising at the Class 6A state tournament. 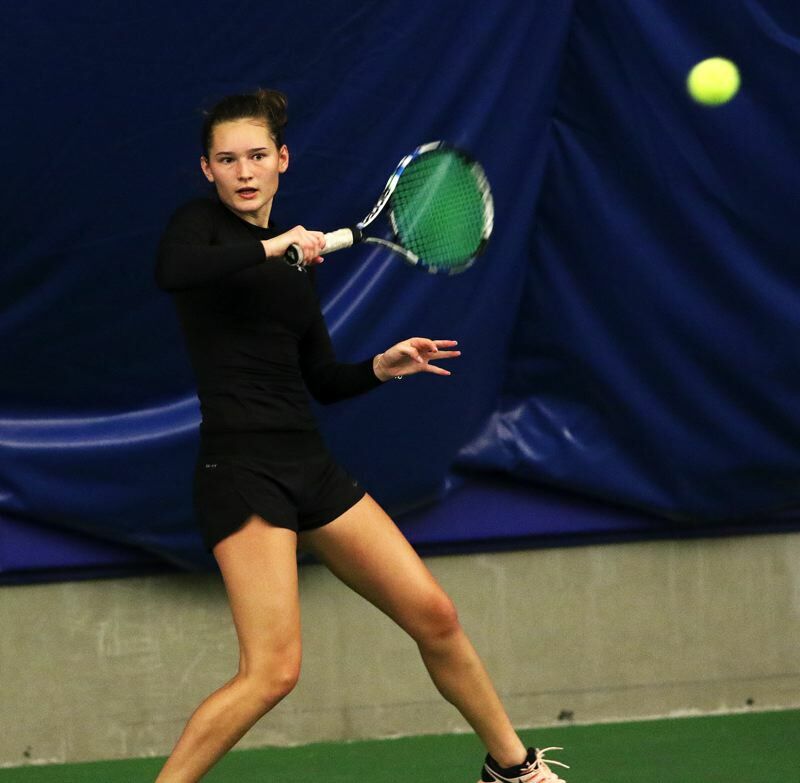 The top four placers in boys and girls singles and doubles play at the district tournament advance to compete at the state event, which will be held Thursday through Saturday at the Babette Horenstein (formerly Tualatin Hills) Tennis Center in Beaverton. 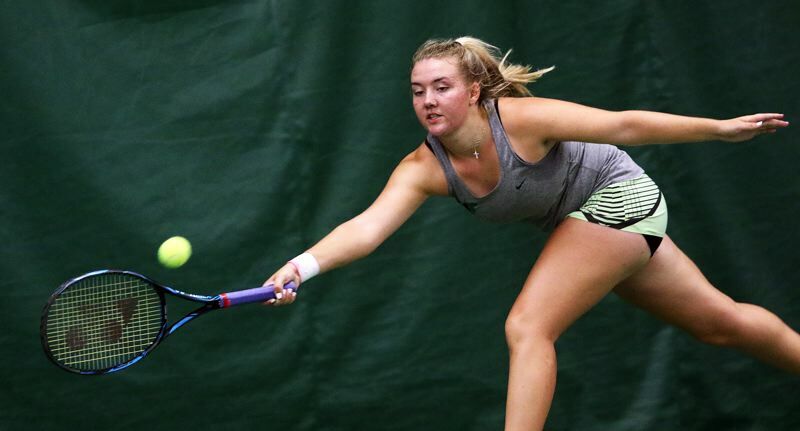 Stevens will be looking to successfully defend the Class 6A state singles title she won last year as a freshman. "I'm looking to win it again," Stevens said. "I just need to focus on my game, and on my opponents, and just keep on playing. I'm just going to focus on every point, not the score, and get my serves in and playing." Stevens, the No. 1 seed, looked to be plenty motivated at the Three Rivers League district tournament. She opened the tourney by scoring a 6-0, 6-0 win over Lake Oswego's Elena Lee. In the second round, Stevens rolled to a 6-0, 6-0 victory against Sherwood's Rianna Upton. In the quarterfinals, Stevens posted a 6-1, 6-0 win over Lakeridge's eighth-seeded Gigi Davies. In the semifinals, Stevens bested Tualatin's Jensen Barnes, the No. 4 seed, 6-0, 6-1. In the championship match, against third-seeded Nechiporuk, Stevens won the opening game of the first set, but Nechiporuk won the next game, tying the set at 1-1. But that just seemed to fire up Stevens, who won the next 11 games in a row to close out the 6-1, 6-0 victory. "I've been working on my first serves a lot, so I'm trying to hold serves more, which I've been doing this tournament," Stevens said. "And, definitely trying to dictate the point." And, when she got the title-winning point, clinching her second straight district title, Stevens got a big smile on her face. "I think it's going to mean more every year, doing it for my school and, since I live away from home (training some in California after switching to online school), it's good to be back and part of the team," Stevens said. "It was a lot of fun." Stevens, the No. 1 seed, will open play at the state tournament with a second-round match against either Alex Thompson of Lincoln or Lilly Stephens of Lakeridge. "Winning is a big thing again," Stevens said. "I've been thinking about it a lot. I just watched my match point from last year a couple days ago. That's good motivation." Barnes, a Tualatin junior, will be making a return, of sorts to the state tournament. She qualified for the state tourney as a freshman, but just missed out last year. "It was important to get back to state this year," she said. "Tennis is my life and it's an accomplishment." Barnes earned her state tourney berth by getting a win over West Linn's Theresa Li in the quarterfinals. Then, after the loss to Stevens, Barnes bounced back to get a 6-2, 6-1 win over second-seeded Stephens in the third-place match. "I played more with a strategy, and I got a lot of help from my coach," Barnes said. "He helped me with my attitude throughout this tournament. I think I played more smart, than I did with power, and that was the way to beat her. It feels pretty good, because I've been working really hard. My season never stops. I feel really good about it, because our league got a lot harder. Last year, I didn't even make it to state, so this feels really good." Barnes will open the state tourney with a first-round match against Madison's Grace Lee. "I'm just looking to play my game, and work on all the things that my coaches and I have been working on, and do Tualatin proud," Barnes said. 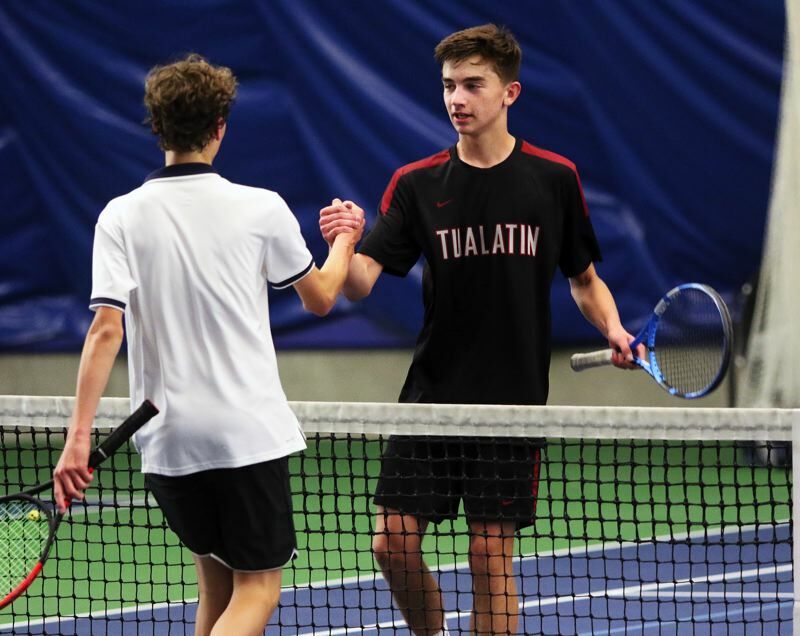 In boys singles play at district, Tualatin senior Will Havenar earned a state bid. Havenar, the No. 5 seed, got the berth by scoring a 3-6, 7-6, 6-3 win over fourth-seeded Will Hinsper of West Linn in a quarterfinal match. Havenar ended up placing fourth, after losing to Lake Oswego's Gabe Horwitz in the third-place match. Havenar will open state tournament play with a first-round match against David Douglas' John Bui. Action at the Class 6A state tournament is set to start at 8 a.m. on Thursday, and 9 a.m. both Friday and Saturday.